May 21, 1917 B/W photo of the great fire in Atlanta, Georgia. Flames jumped from roof to roof across blocks of wood-shingled houses. More than 4,000 Atlantans were homeless before the wind changed and the fire died. (From the collection of Kenneth Rogers, AJC staff photographer). Despite what Metallica says, it’s not always effective to fight fire with fire. In the Old Fourth Ward, however, they are celebrating fire with fire from 2 to 10 p.m. this Saturday on Edgewood and Auburn avenues between Jackson and Boulevard. Fire in the Fourth is the Old Fourth Ward Business Association’s (O4WBA) inaugural street festival. “We have had several festivals in the Old Fourth Ward, but it’s people coming from elsewhere and using our land and taking the profits with them, so this is the first time we’ve had a festival to benefit us,” Matt Ruppert, the O4WBA’s festival chair and also owner of Noni’s on Edgewood Avenue, said. The O4WBA was founded in 2012 and advocates for Old Fourth Ward businesses with initiatives to change the perception of the neighborhood and to create a prosperous environment for businesses to flourish. Noni’s was one of the first three businesses, and now, there are 86 businesses in the organization. Since its creation, the O4WBA wanted to have a festival, and there have been several iterations of the festival before fire was selected as the theme. Fire is big part of the Old Fourth Ward’s history. On May 21, 1917, the Great Atlanta Fire burned the Old Fourth Ward to the ground. “It really was a perfect storm,” urban historian Kit Sutherland said on the conditions leading up to the fire. Atlanta had been a sleepy city until 1900, and as more and more people moved south in the 1910s, Atlanta could not keep up with the growth. Trolley lines connected the city, but infrastructure was weak. Warehouses that stored combustible materials didn’t have sprinkler systems, and most houses and businesses in the Old Fourth Ward had wooden shingles. Atlanta’s fire department in 1917 had horse-drawn trucks and didn’t have the capacity to deal with several fires at a time. Atlanta’s hydrants had low water pressure. On top of the deficiencies of the infrastructure and fire department, it was hot and windy on May 21. Historians aren’t exactly sure where the fire started, but Sutherland guesses that several fires erupted in the Old Fourth Ward’s warehouses, which stored flammable materials like cotton and fabrics. A southern wind moved the fire north, and it raged down the Boulevard and Parkway corridors, jumping from house to house. “The fire moved as fast as a man could walk,” Sutherland said. People threw their belongings out on the streets, hoping for the best, as they could see the fire coming. The fire department horses became overwhelmed and couldn’t continue. 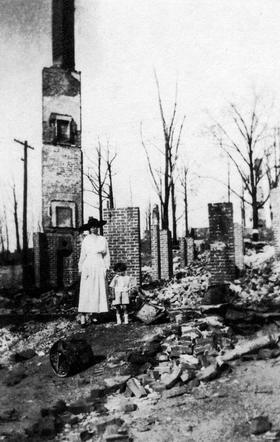 Reinforcements were called in from other cities in Georgia to help fight the fire, but at this point, the fire had already consumed much of the Old Fourth Ward. Then, the telephone lines collapsed, making coordination efforts immensely difficult. The fire fighters were finally able to stop the fire by dynamiting houses to create a break that the fire couldn’t jump over. The fire had raged for approximately 10 hours, and the damage included 300 acres burned, 1,900 structures destroyed and 10,000 people left temporarily homeless. The monetary damages added up to $5 million, which at the time was a huge amount of money. After the fire, the city ordinance banned wooden shingles. Rebuilding the neighborhood was irregular, if it happened at all, and the way the neighborhood was rebuilt changed the socio-economically diverse Old Fourth Ward of 1917. Smaller homes and apartment buildings replaced the hodgepodge of mixed income housing. Instead of homeowners, the new housing catered to tenants. The population decreased due to white flight in the 1950s, a national trend. Then, in the 1960s, the construction of the 75-85 connector walled off the Old Fourth Ward from resources and jobs downtown. “Urban renewal” programs tore down buildings considered eye sores. From 1960 to 1980, the population of the Old Fourth Ward decreased from 21,000 to 7,000. In 2015, however, the Old Fourth Ward bustles with life. Edgewood and Auburn avenues are packed with businesses, and housing prices in the neighborhood have skyrocketed from demand. The O4WBA wants to continue revitalizing the area, and to do that, they need money, which is one big reason for hosting Fire in the Fourth. The other, though, is to have a hyper-local festival experience. There’s lots of fire activities on the docket for Fire in the Fourth. The Musters Competition is a series of relay races by Atlanta firefighters, hosted by the Atlanta Fire Foundation. Local artist Charlie Smith will bring his huge fire sculpture “Big Bully” to the street, which will alight at dusk. The Imperial OPA circus will perform with fire, and founder Timothy Mack will try to beat the Guinness Book of World Records’ timed fire eating. Music will range from the gospel of local churches to the electronic music of Edgewood’s nightlife. Musicians will also play acoustic sets on street corners. There will be a “Fire-rama” paying homage to the Great Atlanta Fire and lectures about that fateful day. The 98th anniversary of the 1917 fire seems like a strange time to start, but Ruppert acknowledged that the O4WBA is well aware that the centennial is just two years away. “This is very much practice,” he says.